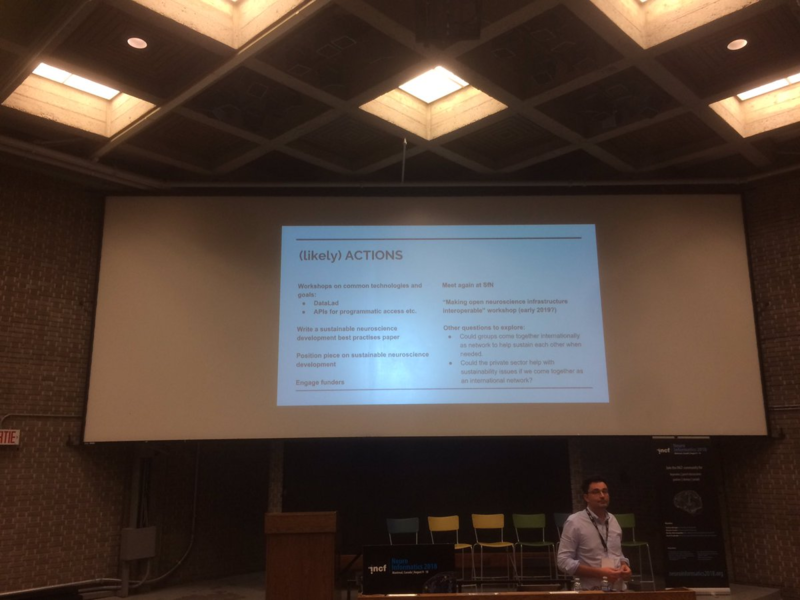 August 7-10, I was in Montreal to attend the INCF Neuroinformatics congress and its 2-day Brainhack hackathon. The program of this conference is usually a mix of neuroscience and neuroinformatics with an emphasis on standards and data sharing. Russ Poldrack presented BIDS and its impressive adoption in the neuroimaging community (slides). 20 000 subjects worth of data are now available online as BIDS-compliant datasets. The standard is expanding: the MEG extension has just been published and more are under development (e.g. intracranial EEG, ). In the "Can we harmonize metadata?" session, Michel Dumontier discussed FAIRness (Findable Accessible Interoperable Reusable) in biomedical computational research and Nolan Nichols showcased applications of those principles in the pharmaceutical industry (slides). In the poster session, Andrew Doyle presented his work on automatic quality control of infant brain images using convolution neural networks. The goal of this supervised algorithm is to make a pass/fail decision on the quality of the MRI image based on a 2D slice at the center of the brain volume. Alejandro de la Vega gave a demo of neuroscout, an online platform to fit arbitrary GLMs to naturalistic fMRI experiment (e.g. watching a movie). Neuroscout uses the pliers library for automatic feature extractions on existing open datasets then, through the online interface it is possible to specify a GLM (w/ BIDS-models) that can finally be run locally via a docker container (based on FitLins). 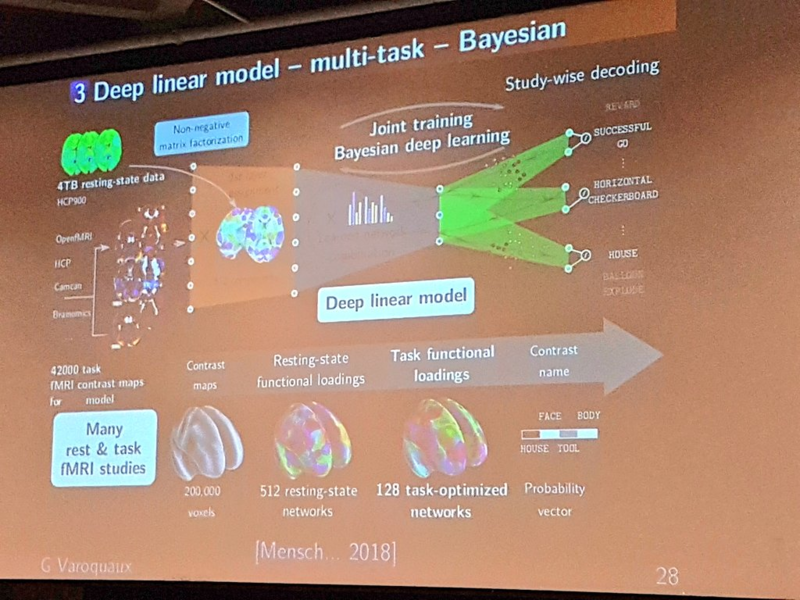 Gael Varoquaux outlined multiple machine learning applications in brain imaging with the goal to infer cognitive states beyond the unwanted specific details of the paradigm, a discipline that he referred to as "psychoinformatics" (slides). On the question of favoring sample size versus homogeneity of a dataset: "more data is better!". Pierre Bellec presented work from his lab in machine learning and statistics to predict patient evolution in the context of early detection of Alzheimer's disease. 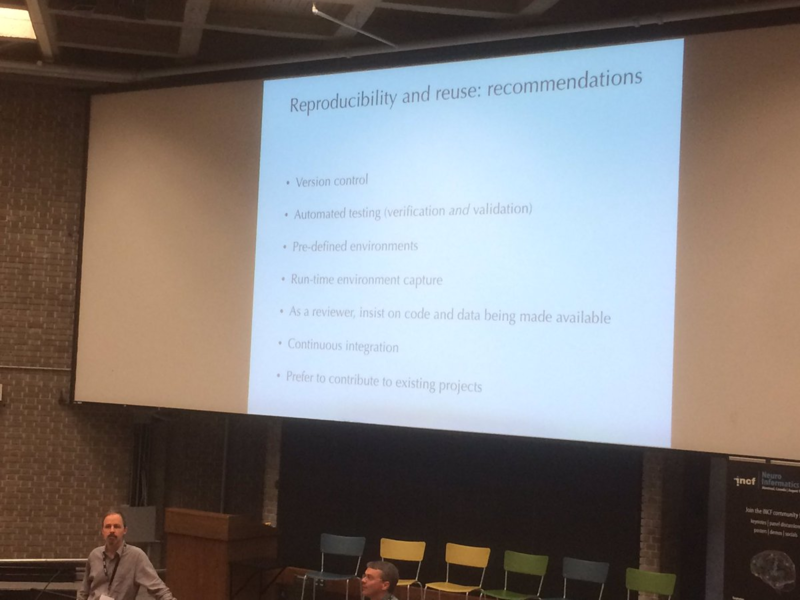 Andrew Davison gave a very nice and practical overview of recommendations to improve reproducibility and reuse (slides) (in system neuroscience) along with the tools available. In the last plenary session of the congress, entitled "Global neuroinformatics", Linda Layon, INCF director discussed the involvement of INCF in the International Brain Initiative (IBI), open for feedback. 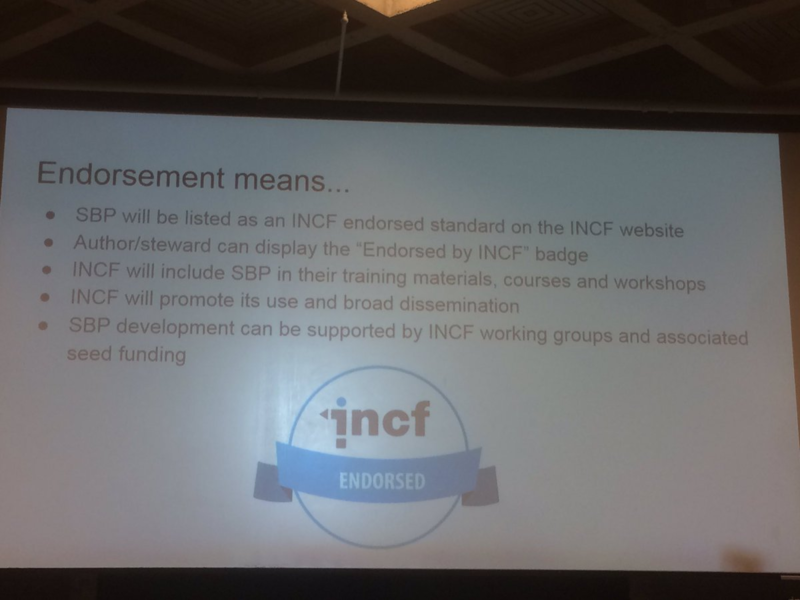 Maryann Martone presented the newly developed process for INCF to endorse standards and best practices. 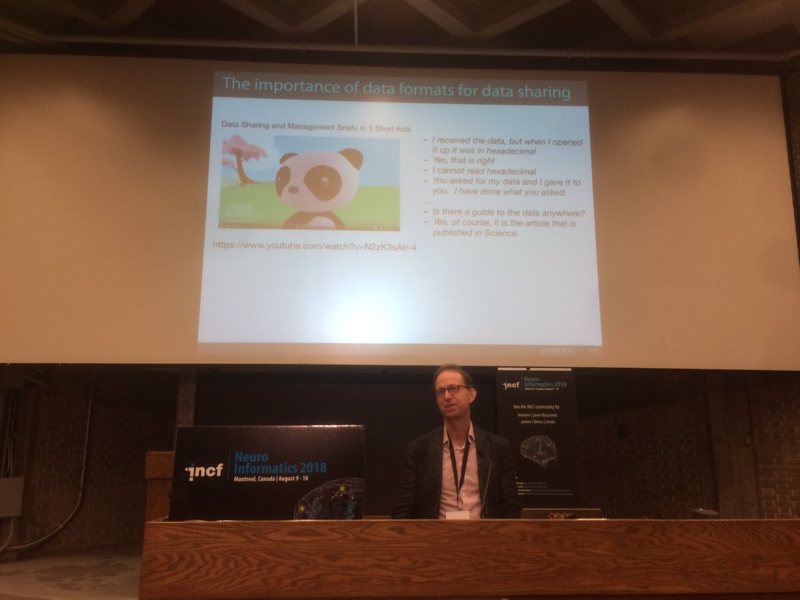 Wojtek Goscinski talked about the infrastructure sustainability effort that aims at finding synergies between international efforts involved in the development of neuroscience research infrastructure (e.g. NITRC, OpenNeuro, etc.). Next steps include technical aspects (e.g. using DataLad) as well as definition of best practices for sustainability. Finally INCF special interest groups (SIG) were introduced along with progress made during the SIG meetings (that were held in conjunction with the hackathon): François Mohameth Sy for Neuroshapes (definition of SHACL schemas for neuroscience), David Keator for NIDM (slides) and Elizabeth Dupre for BIDS. I had the chance to learn more about Datalad, a tool that extends traditional git to allow for data versioning. In particular, datalad run seems to be a great way to track provenance. On the second day, we focused on how to integrate NIDM-Results with Datalad. A brief overview of what we achieved is in these slides.